I don’t know if this a good or a bad habit for any jazz or pop star to release a CD with Christmas music, but (sh)it happens and every year the stores are filled with an endless number of new and old releases of the most popular Christmas songs. I also get into the stores and take a look what kind of stuff is available from the great jazz singers or bands, so I bought “The Christmas Album” from Manhattan Transfer or “Christmas Songs” from Diana Krall. Typically, these CDs have one or two cool arranged and swinging songs and the rest is just candy sweet versions of the famous Christmas tunes. 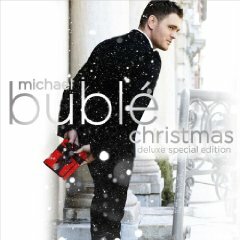 And here came Michael Bublé with his album “Christmas”. The deluxe version I bought has 19 songs on it, all very well recorded, arranged and very easy swinging and only one or two of them are those sugar sweet versions. He seems to have the right Christmas spirit which is just a little bit sweet and sentimental but mostly very happy and excited about these special days of the year. I bought the CD already a year ago, but this year my 16-year old daughter picked it up and since she is also the kind of person that waits after the summer holidays for Christmas to come, the whole family had to listen to this CD for many weeks now, but it still gets not boring to hear Michael Bublé. This CD has been sold over 7 million times so you might already have it – if not buy it (you might even get it at your local grocery store) and I think you will have a musical companion for many more holiday season to come. The Swiss Jazz Orchestra (www.swissjazzorchestra.com) exists now for 10 years (they will celebrate this on January 17, 2014) and they hold a regular Monday night from October to May at the Bierhübeli in Bern (www.bierhuebeli.ch). Once per month they invite a soloist for the Gala-Night and this time it was Sandy Patton, who is quite famous here in Bern since she was professor at the Swiss Jazz School and the Bern University of Arts from 1993 to 2011. Sandy being a celebrity and the perfect timing for a Monday night just before the Christmas holidays packed the concert hall and Sandy and the Swiss Jazz Orchestra did not disappoint the crowd. The program was compiled out of Sandy’s personal favorites including “Come Fly With Me”, “Just Friends”, “Smile”, “Shiny Stockings”, “Lush Life” or “Get Happy” and the band was swinging perfectly. It was a real Gala Night bringing back the great days of Big Band music. Sandy Patton had the time and space for improvising and we heard her unique voice singing, scatting and improvising with this great orchestra in the background. Also, the band itself is made out of excellent jazz musicians and every register got the chance to show its skills in soloing, especially memorable was Philip Henzi on piano on the song “The Island”. The band played two sets and while the first set was quite nice and very well played, the second set really showed a much more relaxed band enjoying the evening with these great timeless arrangements. And then came the encore: It had to be a Christmas song, obviously, and Sandy Patton and the rhythm section alone played a marvelous “Have Yourself a Merry Little Christmas” and this was for me somehow the best moment of this concert because it showed where Sandy Patton is really strong: when playing with a combo. This little piece gave her voice the room it needs to show all the little nuances she is able to do. The evening ended with the blues “Alright, Okay, You Win” which brought everybody into a “shuffle” mode to swing us through the night or just back home.